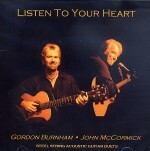 By John McCormick and Gordon Burnham, steel string acoustic guitar duets. This recording came together during a period of powerful musical, personal and spiritual transition, helping us both to navigate through a tumultuous and exciting time in life's journey. The music is introspective and serenely joyful, a musical meditative journey generating an atmosphere that lifts and releases the heart and soul. 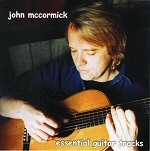 This is a collection of North American music; ten songs and one guitar instrumental. This recording captures the live transmission of music through an artist to his audience. Above all else, John relishes live performance more than any other aspect of his work. He is a transmitter. Between Our Hearts, contains two original guitar tunes and two traditional ones, along with nine songs from before and now. With the support of Maggie Boyle (vocals, flute, bodhran), Judi Meister (fiddle), Steve Tilston (arppeggione) and other fine guests, this is a highly acclaimed album. "A fine collection of moody songs, strung together like smoky pearls." Mostly contemporary songs from the US and abroad, with two guitar instrumentals. One of the Top Ten Albums of 1992 on WUMB, Boston. A guitar focused project with five instrumentals and seven songs from Ireland, Scotland and England, "Western Island is a bit of paradise for fanciers of graceful acoustic players." Produced by Alex DeGrassi, and now reissued on CD.